Before the European Settlers entered this part of North Carolina, these mountains and valleys were the exclusive domain of Cherokee Indians. The Cherokees had their own names for Mount Pisgah and the Pisgah Ridge. The mountain was Elseetoss and the ridge was Warwasseeta, and around them and the land was rich in game and lush with trees and other plant life. In 1776, General Griffith Rutherford led an expedition against the Cherokees. Accompanying this expedition as a chaplain was one James Hall. 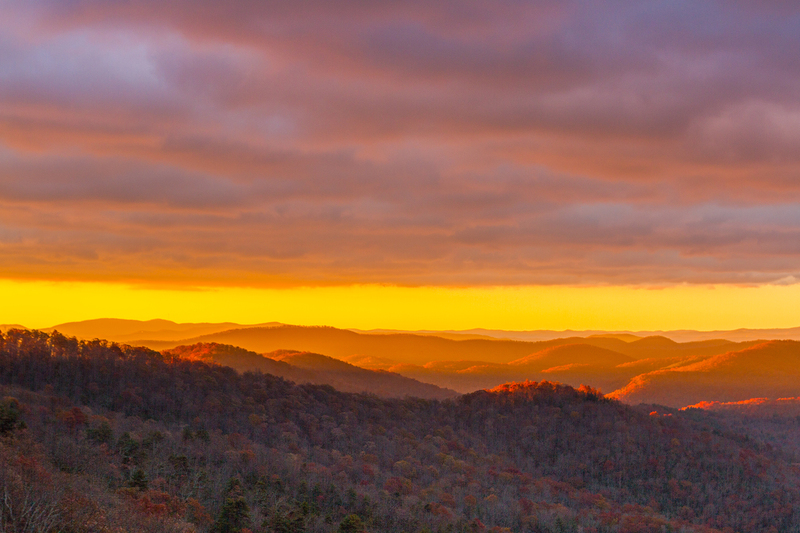 The men of the expedition saw the mountain from the French Broad River valley and saw a rich land around it – a land of milk and honey, a promised land. James Hall, preacher and soldier, is credited with drawing the parallel with the land that Moses saw from Pisgah and applying the Biblical appellation to this mountain. Newton was a Presbyterian minister who lived and taught in the late 18th and early 19th centuries at what became Newton Academy in Asheville. Reverend Newton is credited with naming Mt. Pisgah. Because of the extensive view in all directions over a rich land, Reverend Newton felt there was similarity between this mountain and the one on which Moses stood. Thomas Lanier Clingman was state legislator, United States Congressman, United States Senator, Confederate General, and somewhat given to controversy. Clingman’s Dome in the Great Smoky Mountains National Park is named for him. He left his mark in the history of North Carolina through his famous argument with Dr. Elisha Mitchell (for whom Mt. Mitchell was named). He has been described as “an intrepid man of most arrogant and aggressive character, greatest self-confidence, unlimited assurance, prodigious conceit, stupendous aspiration, immense claims, more than common ability, no considerable attainment or culture, great boastfulness, and much curiosity.” Mr. Clingman owned 300 acres (1.2 km²) on and around the top of Mt. Pisgah. He owned this land from the 1830s until shortly before his death in 1897, when he sold this land to George W. Vanderbilt. George Washington Vanderbilt was the grandson of the “commodore” Cornelius Vanderbilt. Mr. Vanderbilt began buying land South of Asheville in 1888, and by the time he finished, he owned about 125,000 acres (506 km²), including Mt. Pisgah. Near Asheville, he built his famous Biltmore House, the grounds of which Frederick Law Olmsted landscaped. Two other famous names are associated with Vanderbilt and Biltmore Estate. In 1891, Gifford Pinchot, recently returned from studying forestry in Europe, became Chief Forester of Biltmore. Here, with Mr. Vanderbilt’s strong support, he introduced scientific forestry to the United States. In 1898, Pinchot was named head of the Forestry Division of the United States Department of Agriculture. Dr. Carl A. Schenck of the University of Darmstadt came to the United States to succeed Pinchot. When Dr. Schenck came to this country, there were fewer than half dozen trained foresters, and all had studied forestry in Europe. There was no place in the United States to study forestry. With George W. Vanderbilt’s support, Dr. Schenck founded the Biltmore Forestry School in 1898. Classes first met in the village of Biltmore, upstairs in what is now the headquarters of the Biltmore Company. This building is a Registered National Historic Landmark. The field school for the Biltmore Forestry School was near the foot of Mt. Pisgah. The United States Forest Service has done an excellent reconstruction of this school at the Cradle of Forestry in America. In 1911, the United States Congress passed the Weeks Act. This monumental piece of legislation permitted the US Forest Service for the first time to purchase forest lands. In 1914, the Forest Service purchased nearly 80,000 acres (320 km²), including Mt. Pisgah, from Edith Vanderbilt as a part of what is now the 479,000 acre (1940 km²) Pisgah National Forest. In the Mount Pisgah area, the Vanderbilts kept 471 acres (1.9 km²) in Buck Springs Gap, about a mile (2 km) from Pisgah Inn. Here, George W. Vanderbilt had constructed a popular log hunting lodge. The main lodge had four bedrooms, a breezeway-connected building had two bedroom suites, and the kitchen/dining building was connected to the other two. There were several buildings near these buildings. 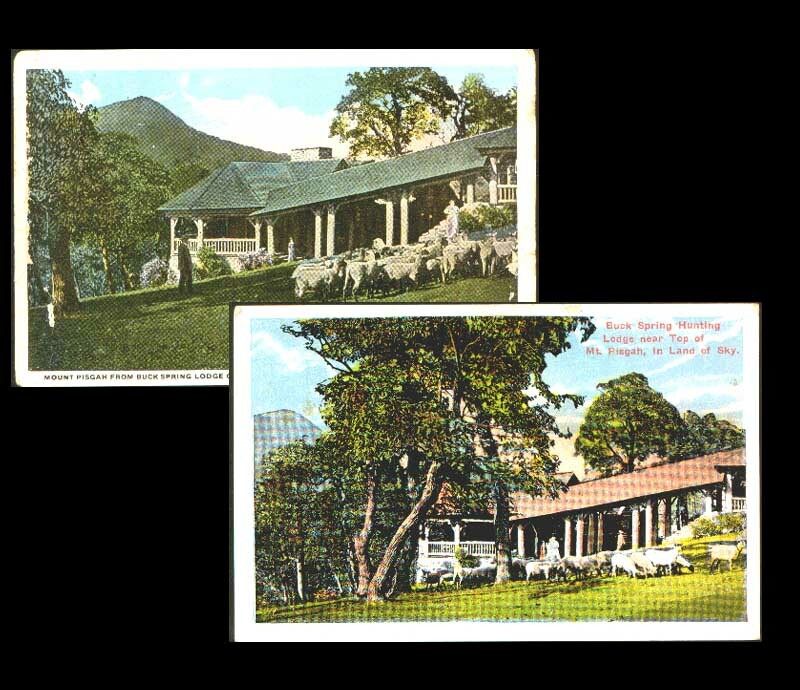 Mr. Vanderbilt built the Buck Springs Lodge just before the turn of the century, and all of the buildings were razed in 1961. The Mt. Pisgah area has been a popular resort area for a number of years. 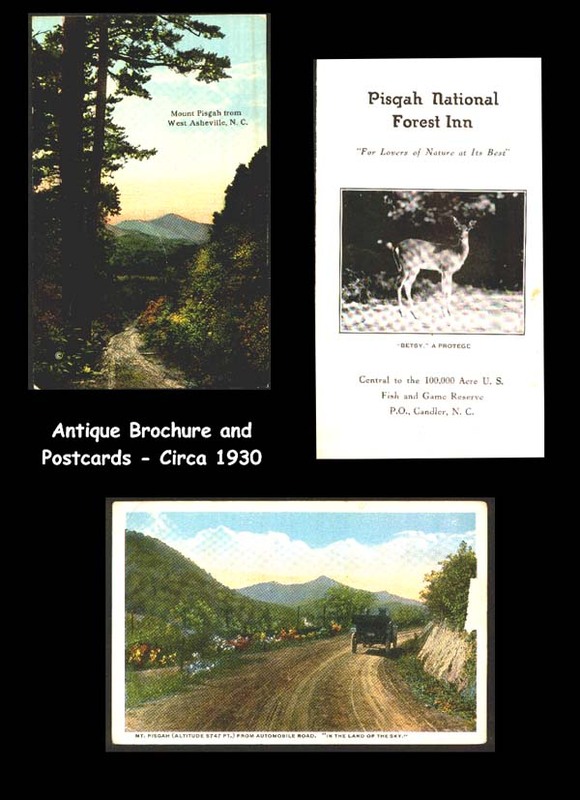 The first Pisgah Inn opened about 1918. This rustic old Inn was a welcome journey’s end for thousands of travelers escaping from the heat of the lowlands in the summer. 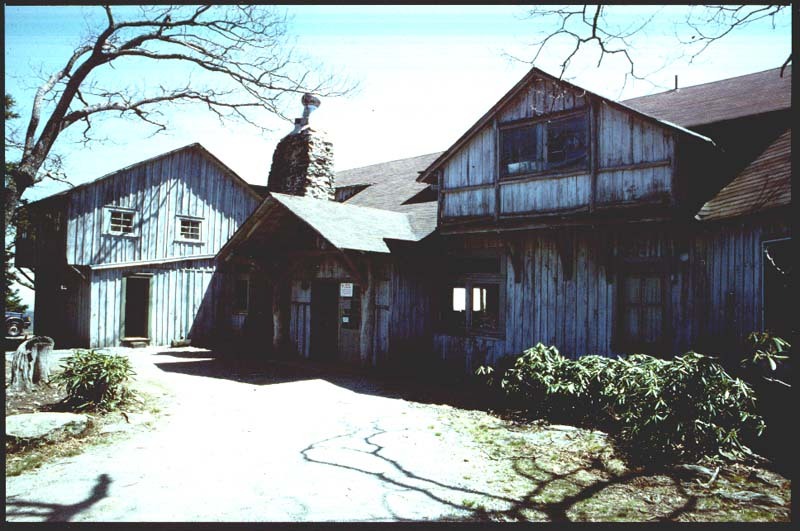 Development of the modern Pisgah Inn began in the early 1960s. The original Inn was disassembled in 1990 due to safety concerns. Most of the Blue Ridge Parkway in this area was built across land transferred from the U.S. Forest Service. The exception was the 471 acres (1.9 km²) around Buck Springs Lodge. The State of North Carolina purchased the land and the lodge in 1959 and transferred the land to the United States for the construction of the Blue Ridge Parkway. The Blue Ridge Parkway through the Mt. Pisgah area was opened for travel in the mid-1960s. The present Pisgah Inn was built in 1964. From 1964 until 1978, the Inn was owned by Aaron Prevost. Under his able ownership, a series of different managers directed operations. In 1977, the manager, Mr. Wright, passed away leaving open the position of Manager. In 1978, the O’Connell family came on board. Tom and Phyllis were retired hotel operators. Bruce, their son, had just graduated from the Cornell Hotel School. 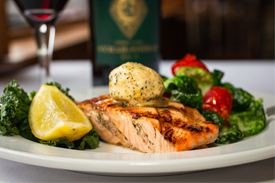 Together, they took the helm with Bruce running the food operation and Tom running the hotel division. Phyllis was the anchor that held the whole place together. Tom passed away in 1985 leaving Bruce and Phyllis to manage the Inn. Bruce O’Connell runs the Inn with the help of his mother and some long term, key staffers. The present concession’s contract expires in 2024.